Why Hike the Wawona Meadow Loop? If you think no one could possibly look at a beautiful meadow in the middle of a national park and say, "Hey, let's put a golf course here! ", you're mistaken, and here's your chance to see the proof. Best Times to Visit: In the spring, when the meadow is green and the wildflowers are blooming, and the autumn, when the trees along the path are turning colors. Difficulty: 2 out of 10. The trail is wide and smooth. It was paved at one time, for reasons unknown - maybe they wanted a nice NASCAR track to go around the golf course - and the pavement is gradually disappearing. You'll have a mild net ascent on the first half of the hike and a corresponding descent on the second half. Crowd Factor: Light. Even on days when traffic is bumper to bumper in the valley and backed up out of sight at the entrance gates, I've only run into a handful of other people on this trail. Scenery Summary: There is a 9-hole golf course here, but things could be worse - the park fathers could have built an 18-hole course and driving range and used up the entire meadow. Instead, the golf course occupies the northwest end of the meadow and the trail loops around the southeast end, and they're only entangled for a few hundred meters (the satellite view shows clearly what parts of the meadow the golf course occupies). For the most part, you get a pastoral stroll skirting the edges of one of Yosemite's largest meadows. There are no memorable mountains in view here, but you get both meadow views and a pretty tree-lined path (to your left and right, respectively, if you're hiking anticlockwise), and in the spring and early summer, great gobs of wildflowers. Because the trail is the residue of a paved road, this is one of the few trails in Yosemite where pets and bicycles are allowed. With its soothing views, low elevation (by Yosemite standards), and near absence of climbing, it's also one of the best places in the park to go for a run. Parking: There's usually space available at the Wawona Hotel lot. If it looks crowded, check the dirt lot next to the tennis courts, which is usually the last to fill up. If everything's full, try the snack shop just around the corner. Though the lot directly in front of the store is for short-term parking, you can park all day just past the shop, near the Pioneer History Center. There's also room to park at the eastern trailhead (the one along highway 41), and in the trees beyond the western trailhead, which is on the far side of the golf course. I've never gotten official confirmation that it's OK to drive across the golf course in private vehicles, but there is a road over there - the old Wawona stagecoach road, with forks leading to Fish Camp and the Mariposa area - so presumably it is, and it's common to see cars parked there. Nearest Snacks: There's a convenience store just around the corner from the Wawona Hotel and a restaurant in the hotel itself. If neither of these options inspire you, there are a couple more restaurants at the Tenaya Lodge in Fish Camp, seven miles (11 km) south, and another restaurant at the Narrow Gauge Inn, which lies an additional two miles past the Tenaya. Getting There: From the Yosemite south entrance, turn left and drive 4.6 miles (7.4 km) to the Wawona Hotel. From Yosemite Valley, take Highway 41 for 21 miles (34 km) to the same location. The anticlockwise trailhead is directly across the road from the entrance to the Wawona Hotel parking lot; see these Google Street View panoramas of the anticlockwise and clockwise trailheads. Hazards: Horse exhaust. And in the evenings, mosquitoes. In the spring you may also have to break out your rock-hopping chops for a few shallow water hazards. There have also been occasional mountain lion sightings in this area. In 2006 the park service posted bulletins warning that a mountain lion had been seen north of the highway on the trail that leads from the Wawona Hotel to the Mariposa Grove (if you take the long version of the loop, you'll hike part of this trail). In addition, a park ranger told me that there had been three confirmed sightings in the area during the summer of 2007. It's extremely unlikely that you'll see a mountain lion and even more unlikely that you'll be threatened or dined upon by one, but you should be aware of the possibility if you're using Wawona Meadow as a running trail. I've never personally seen mountain lions here, but I have seen lots of deer, a few bears, and on one auspicious occasion, a bobcat sauntering down the trail. The woods around the meadow are also home to the rare Mountain Lady's Slipper orchid, which, if you find, you should not disturb. Trail Notes: Officially, this trail is a horseshoe with signed trailheads at either end, but it's effectively a loop because the trail continues past the trailheads and covers most of the distance (about a quarter of a mile) between them. The first trailhead is on the far side of the golf course, directly across the road from the Wawona Hotel. The second trailhead is along highway 41, just where the golf course ends. If you've been indoctrinated by high school track to always do your loops anticlockwise, you'll finish at the latter trailhead, at which point you can cross the road and take the trail back to the Wawona Hotel, a few hundred meters farther on. If you're doing the loop clockwise and parked at the trailhead, you'll finish at the Wawona and can then make your way back up the highway to your car. In either case, it's not very complicated and it's already been given more attention than it really deserves. If you want to hike an extra long (5-mile) version of the loop, there's a detour at the far end of the meadow, where it's looping around the meadow's southern edge. It's next to a stream crossing with a culvert. (There are two culverts along the southern end of the trail; if you're hiking anticlockwise, it'll be the first one you reach.) This detour will take you uphill, across highway 41, and then westward down the ridgeline, eventually finishing up, like the normal loop, at the Wawona Hotel. You'll climb steadily from the point you start the detour until a short ways after you cross highway 41. To see where the trailheads are or get an idea of the detour route, check out the satellite view. 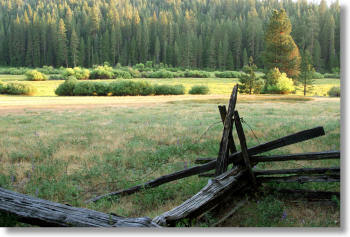 Already been to Wawona Meadow? Add a Review.